It's hard for a band to establish an identity of it's own anymore. In the case of Belgian progressive rockers Present... well, give me a new album and I'll recognize the music as being theirs instantly. However, this achievement can be a double-edged sword as it's easy for the artist to fall into repetition that can get old after a while. 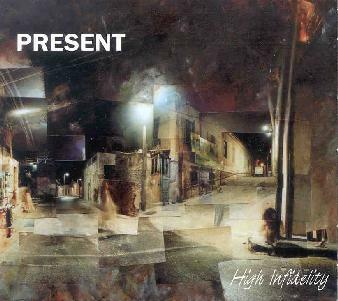 In the case of Present, though, their new album, High Infidelity, continues to delight by reaching new heights of compositional complexity and explosive performance, and breaks new ground for the band by adding instrumentation that they haven't typically used in the past. Returning from the previous release (No. 6) is father and son Roger and Reginald Trigaux on guitars and vocals, Dave Kerman on drums and vocals, Pierre Chevalier on piano, mellotron and vocals, Keith Macksoud on bass, Yuval Mesner on cello, plus additional instrumentation from Matthieu Safatly on cello, Fred Becker on alto & tenor sax, and Dominic Ntoumos on trumpet and flugelhorn. Ok, I'll be blunt... Present is one of the most exciting and potent rock bands in the world today. They've harnessed the raw power and majesty of early 70's King Crimson and Magma and combined it with the dark intensity of Univers Zero (of which Trigaux was a founding member) to create a form of orchestrated rock music that few match for sheer power and ability to entrance the listener with its presence. The 6-part 27 minute "Souls For Sale" is classic Present. It's a thematic roller coaster ride that continually transitions between high energy sections and dark eerie passages. The Trigaux's guitars can cut to the heart with a single note. Macksoud's bass has that pounding Zheul styled effect. Kerman's drumming is far from a mere rhythmic device, being as integral to the creation of passion and composition of the music as the other instruments. Chevalier's piano is absolutely key to the trademark Present sound (though I do still miss Alain Rochette). And the welcome addition of horns on the album makes the dominating presence of the music even more so... much like the horns heard on Dr. Nerve's albums. Vocals haven't typically been Present's strong point, though on "Strychnine For Christmas" we have the first vocals that I've really felt worked well for them. The mellotron gives an extra unearthly feel to the heavily orchestrated sound of the music that I really enjoyed. Macksoud is really a killer bassist and we get to hear some excellent rolling runs from him that got my head bopping. Finally, "Reve De Fer" rounds out the set with more commanding horns and some of the most searing non-piano keyboards I've heard on a Present album yet. If you're already a Present fan then you're guaranteed to enjoy High Infidelity. But if you're among the uninitiated then do yourself a favor and experience how truly exciting and intense rock music can be. HIGHEST recommendation. For more information you can visit the Present web site at: http://www.totalzoo.com/present.